Your reference number can be located at the top right hand corner of any correspondence you have received from us. 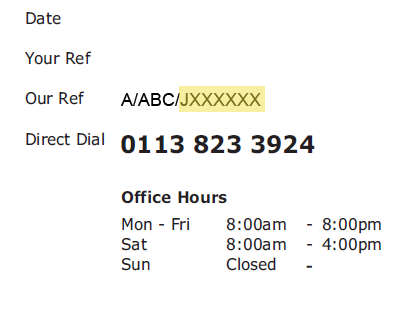 Please ensure that you only input the characters as demonstrated by the above text highlighted in yellow, for example, you would only enter 'JXXXXXX', not 'A/ABC/JXXXXXX'. The easiest way to manage your account. Register to create a secure account here.